2006 –2010 Graduation B.F.A. ( Specialization: PAINTING )College of Art & Design, Burdwan University, West Bengal. Award of Sponsorship for Solo Exhibition, 29th National Exhibition of Contemporary Art 2016, South Central Zone Cultural Centre, Nagpur( Ministry of Culture, Government of India), 2016. Participate: The 6th Tokyo International Mini-Print Triennial, Tokyo, Japan, 2018. Camlin Art Foundation, Patna & Kolkata, 2008 & 2009. 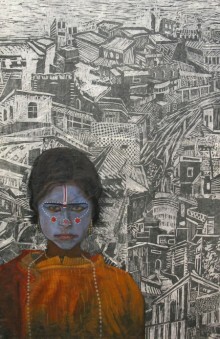 Project Art Nexxt, Lalit Kala Academy, Delhi & State Art Gallery In Hyderabad, 2012. 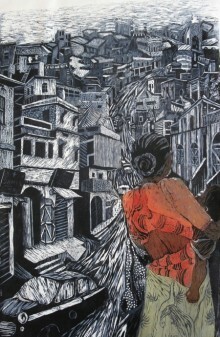 Group Show In Mirage Art Gallery, Kolkata, 2013. 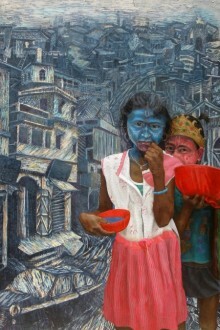 Group Show In Mirage Art Gallery, Kolkata, 2014. Site Specific Installation with Paula Sengupta & Surekha, S.N.School2010. Seminar on Popular Visual Culture of India Presented by Yousuf Saeed, Department of Fine Arts, S.N.School, University of Hyderabad, 2011. Paper Making Workshop in Kolkata, 2009. Participated Workshop With “Rajyacharu Kala Prasad” At West Bengal In 2005.